Hello dear friends, ForeUI V2.42 is out today! This version focus on simplifying the way to share custom element library internally, and has 6 bugs fixed. 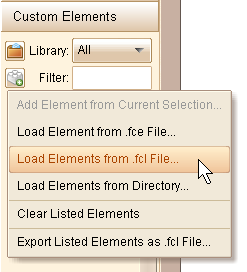 Load Elements from .fcl file…: Pick an .fcl file and then load all its elements into the “Custom Elements” category. Load Elements from Directory…: Specify a directory and then load all elements inside into the “Custom Elements” category. Clear Listed Elements: Remove all elements that listed in the “Custom Elements” category, will not delete the .fce files for them. 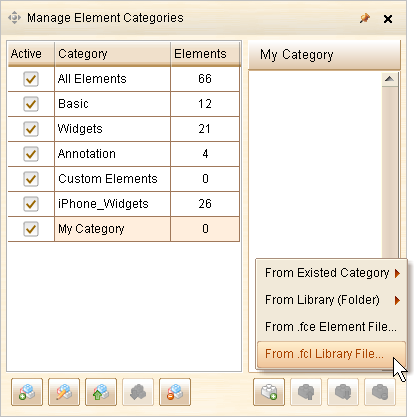 Export Listed Elements as .fcl File…: Export all elements that are currently listed in the “Custom Elements” category. This is a small feature requested by purplebluegreen. Now you can change the size of scrollable container during the simulation. This may be quite useful when creating interactive prototype. 6 bugs are fixed in this version. Bug_0231: Use arrow keys to move embedded element, the wrapper group is not updated as well. Bug_0233: Embedded element may be positioned incorrectly at the first time that launch the simulation. Bug_0235: Embed ComboBox element into Scrollable Container, the ComboBox’s popup should be displayed over the container. Hello everyone, after one month holiday, we release V2.40 today. This release includes some important new features and enhancements to ease the container usage, 7 bug fixings are also included. Allow moving member within element group. Allow adding member to existing element group. Allow extracting member from existing element group. Auto grouping multi-selected elements before embedding into non-group container. Can embed element into nested container. All these together provide a much better experience on container usage. 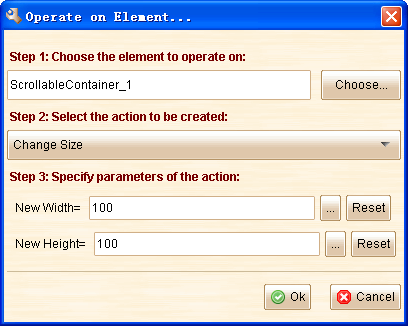 You can embed multiple elements into container a time; you can embed more element into a container even it has embedded element already; you can extract any embedded element from its container; you can move or resize the embedded element… The animation below shows the example of container usage, which has become much more flexible. If you use container a lot in your plot, sometimes you may feel difficult to select a specific container or embedded element. From this version you can find the “Element Path Links” in the floating tool pane if you select an embedded element or a non-empty container element. These links can help you to quickly select the container, the sibling or child element for current selected element. Bug_0224: Multiple instances of custom element may have duplicated ids for embedded element. Bug_0225: Element is not valid after being embedded into ScrollableContainer, until moving the container a bit. Bug_0226: Copy a Tabs (or Vertical Tabs) element that contains image elements, then paste it to another plot, the images are not migrated to the plot. Bug_0227: Can not click to switch tab in edit area for Tabs or Vertical Tabs if they are embedded. Bug_0228: Element chooser: select an embedded element, then select a non-embedded element, the embedded element should be unselected. Bug_0229: Newly created, unsaved plot can not use the display controller to show/hide elements.